April 12, 2019 at 2:40 am. New Oakland Raiders general manager Mike Mayock spoke to the local media on Thursday ahead of the team kicking off its first series of organized team training activities of the spring. It’s safe to say the first-year GM knows what he’s getting himself into. Winning has not come easy for the organization that has preached a commitment to excellence for decades but has not lived up to its storied lineage in recent years. Since last reaching the Super Bowl in the 2002 season — and losing to current Raiders coach Jon Gruden, who returned in 2018 for a second stint with the team — the Raiders have the second-worst record in football with a winning percentage (.332) better only than that of the Cleveland Browns. Oakland has just one winning season in the past 16 seasons, which is why Gruden and Mayock are teaming up for one of the NFL’s ultimate challenges: Restore the Raiders. Despite coming off a 4-12 season and another last-place finish in the AFC West, the Raiders have hope in that they are armed and ready to rebuild via the NFL draft later this month. Oakland has a league-best three first-round picks (Nos. 4, 24 and 27 overall), adding a pair of them last year by shipping out veteran stars Khalil Mack and Amari Cooper in controversial trades. That draft arsenal has Mayock excited for what’s to come. “Between 24, 27 and 35 (Raiders’ second-round pick) we have three awesome opportunities,” Mayock said. “I happen to like 20 through 60. Always have. I think there are a lot of guys that love the game and are safer picks, sometimes, than top-10 picks. The team has been among the busiest in free agency this offseason in attacking some of those holes. The Raiders’ most prominent move was to trade for four-time All-Pro wideout Antonio Brown, who turned a self-made controversy in Pittsburgh into a new team and contract extension. Oakland also bulked up its offensive line, signing away massive 6-foot-8, 380-pound offensive tackle Trent Brown from the New England Patriots. As much as the offense and quarterback Derek Carr (4,049 pass yards, 19 TD, 10 INT in 2018) could use more help, major holes exist on defense. They finished with the NFL’s worst scoring defense for the second time in the past five seasons, and only recorded 13 sacks for the entire regular season — a franchise-record low by far and a mere half-sack more than Mack himself (with the Chicago Bears after being traded away) in 2018. With all of those needs on both sides of the ball, Mayock’s biggest challenge may be trying to keep Gruden satisfied in regards to incoming talent. “I’m a son of a coach and I know how coaches think, and coaches think need,” Mayock said. “And we’re a coach-driven building, our coaches are highly involved. That’s good. I embrace that. 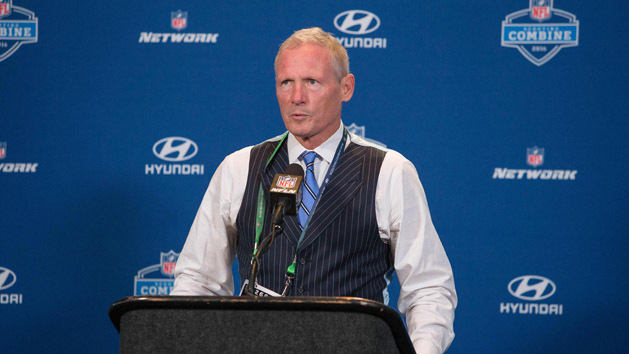 Mayock shrugged off any perceived pressures coming from his animated head coach and from the outside world, especially considering this marks his first official front office job for any of the 32 NFL teams after being a well-respected draft analyst for years with NFL Network. Still, with all the optimism, Mayock knows the pressure is on to hit it big with his top picks in two weeks.